failures I am happy to submit info and pictures of my final fun project, which is the envy of the neighborhood. 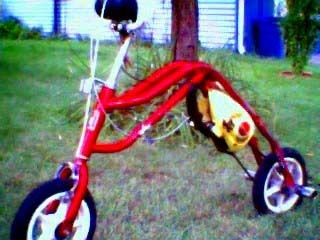 It is a belt drive, running a 3 speed hub that has been grafted into a nylon wheel. I haven't done anything to the clutch except put a real thin washer behind it and lubed the side next to the motor so the belt isnt cut up. The teeth on the clutch are not very pointed and I believe there are five of them. The belt fits snugly between the back of the clutch and the washer up against the motor. I really don't know if the bottom of the v groove actually touches the teeth, more like gripping the side of the v groove and the washer. I am still on the original belt, but have noticed some wear and rubber dust behind the clutch. removing the platform. 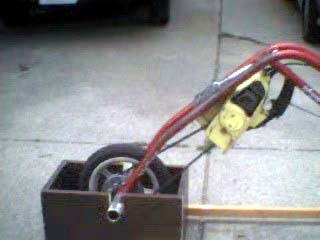 It is a standard 12" older style Magna brand push scooter, made in the R.O.C. I added BMX type pegs on the rear axle which the boys stand on. 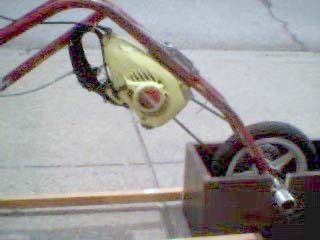 The scooter is belt driven by a Skilsaw 1616 chain-saw motor. (Out of business over 20 years ago and discontinued) Parts? What parts! The chainsaw was given to me, what can I say? one through the rod and the other through frame of the scooter. The rear wheel hub was milled out to accomodate a three speed hub from a J.C. Penney bicycle. pulled to change gears internally in the axle. 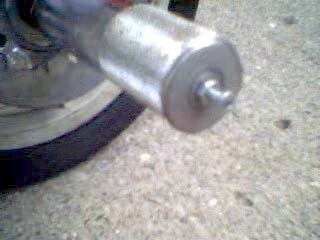 A 5" diameter pully is mounted to the sprocket. A 2"
mount exactly where the chain links fit over the sprocket. (9) 3/8" bolts with lock washers secure every other hole because one in each hole wouldn't fit. 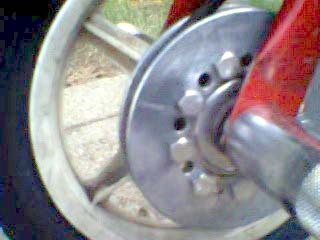 The welded rear brake support and brakes were removed so I could stretch the frame at the wheel so the wider 3-speed hub and sprocket would fit. I haven't replaced the brake and frame support yet, so I now only have front brakes. I have already gone through one set of front pads, but rear brakes will be added again later. The belt at the motor fits behind the clutch where the chain goes with no other modifaction other than a thin washer next to the motor. Having a pully built into the clutch would be nice though. 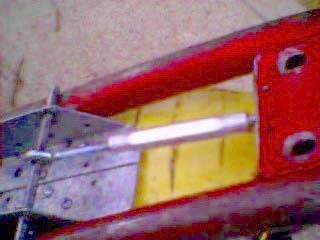 peg for different gears and weight of riders..